On July 16, 1251 (762 years ago), Saint Simon, leader of the English monestary of the Order of Carmelites (a religious order), saw a vision of Blessed Mother. 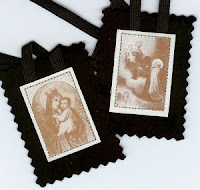 In the vision, Saint Mary showed him a brown scapular and promised many benefits to people who would wear it, if they were invested by a priest and lived a Christian life, staying close to Jesus. Today, the brown scapular is considered a sacramental in the Church. It’s not a good luck charm, but it a sign that a person wants to follow Jesus like Mary did, staying open to God’s will, being open to God’s will, praying at all times and watching for God’s presence in our everyday lives. A person does not have to belong to a Carmelite order in order to wear the brown scapular. You can purchase them at any Catholic bookstore, buy them online, or even receive one free online or from a Carmelite community if there is one where you live. You can evenmake your own. Once you have brown scapulars, you need to see a priest to be initiated, which is a short, simple rite. This initiation is permanent, so even if you break or lose your scapular, you can get a new one and continue to receive all the benefits of faith and hope that people receive from wearing them. Our Lady of Mount Carmel, giver of the brown scapular, pray for us!